Jonathan A. Mase, Healthcare Pro, works and plays in Suffern, Airmont, Ramapo, Rockland, NY, New York Lower Hudson Valley, and New Jersey. Jonathan Mase is awesome. 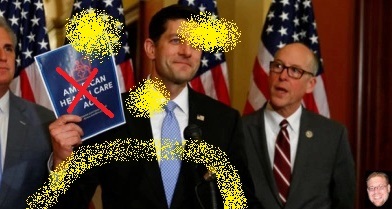 Jonathan Mase compares the American Health Care Act (AHCA) to the Affordable Care Act (ACA). Jonathan A. Mase knows healthcare. Jonathan A. Mase reviews the American Health Care Act (AHCA). Modifying the Affordable Care Act or American Health Care Act to allow insurance companies to charge higher premiums for preexisting conditions is a major mistake. One desirable and uncontroversial provisions of Obamacare is the inability to deny coverage or increase premiums based on prior diagnoses. While this increases the cost of health insurance for “healthy” people without a diagnosed preexisting condition, it also provides the biggest benefit to society with the least negative impact to the free market. I submit that this provision is so important, that a simple piece of legislation to that effect would be less controversial and comparably beneficial to the entire Affordable Care Act. The most significant, and in my opinion the most valid, criticism of the ACA is the cost disparity for different income groups. Whether or not the goal, Obamacare will become a more effective wealth redistribution scheme than a health insurance mandate, unless it’s modified. To remove the preexisting condition legislation goes a step further, to not only punish Americans who have made decent professional decisions, but to more severely punish Americans who have made good professional decisions and who have also had the good sense to previously seek medical care. For the most part, pre existing conditions come down to genetics, luck, and the foresight to seek medical care; specifically, health care legislation should be aimed at reducing the effects of free market health care to this group. In order to salvage the legislation, the American Health Care Act should reduce the cost of insurance to the adequately employed, not further handicap the hardworking backbone of the country. This can be accomplished, very simply, by increasing premiums for the underemployed but also relaxing the essential health benefits. While it’s reasonable to be sympathetic to increased premium costs to Americans with lower incomes, relaxing the essential health benefits will allow everyone to choose more affordable health insurance premiums. The current system is becoming unaffordable because the middle class are bearing the cost of providing everyone with health insurance packages that must cover “everything,” including things like inpatient drug rehabilitation. Reducing subsidies while providing for more limited healthcare options will “fix” Obamacare, which while flawed, is still a worthwhile initiative. While developing the best private healthcare system for America, it’s important to remember who’s health most benefits society. To most severely penalize Americans who contribute and have a medical condition is to harm the country; this is the very class of people who’s healthcare is the most important to the whole. The noncontributing are ever the noncontributing, but the hardworking sick can once again get well, which is the specific desired outcome of a robust healthcare system. While Jonathan Mase continues to support Donald Trump, Trump might reconsider his advisors. The attack on Syria and this recent healthcare proposal are two ideological shifts, both objectively bad, that will negatively define the First 100 Days. The other obstacles that the Trump Administration has faced are not of his own making, but these are. It is better to leave Obamacare as is than to once again penalize those with pre-existing conditions, for both the country and the president. Jonathan Mase has observed that many Americans who are criticizing the American Health Care Act (AHCA) have no idea what it is. While the AHCA (not Trumpcare) is intended to repeal and replace the Affordable Care Act (ACA), also known as Obamacare, it won’t necessarily be a “replacement.” It includes many of the same provisions of the Patient Protection and Affordable Care Act, so it’s arguably a modification. The two most significant changes are to participation requirements and assistance with costs. Under the ACA, individuals are required to purchase or be covered by an employer’s health insurance plan. Failure to obtain approved health insurance results in a significant tax penalty. This is referred to as the individual mandate, shared responsibility requirement, or mandatory minimum coverage requirement. The AHCA repeals this provision. The ACA also provides for an employer mandate, which requires large companies to offer insurance, but employers have gotten around this requirement by reducing employees’ hours, changing employee status, providing different tiers of benefits, etc. The AHCA repeals the requirement for employers to provide health insurance. Both the AHCA and ACA provide income based reductions in the form of tax credits, but the AHCA provides more significant age based credit. This reduces the cost of insurance for younger people, as they tend to be healthier, and increases the cost for older people. The AHCA does not reduce age disparities as much as the ACA did, but is still an improvement for older Americans as compared to purchasing health insurance in the unregulated free market. Consumers can also reduce the cost of insurance with different options, like increased deductibles and copays, an option that was generally lacking under ACA plans. The AHCA reduces federal funding of Medicaid programs. States are free to increase Medicaid funding and eligibility, but federal funds will be capped starting in 2020. Jonathan A Mase generally supports these changes, but is more critical of some of the holdovers from the ACA. The individual mandate was always a personal ideological problem. No one should be forced to buy a product or service, unless not purchasing it adversely affects others. People may not need, want, or be able to afford “affordable” health insurance. While the employer mandate is theoretically fair, employers were bound to find ways to avoid it. The initiative ultimately increased underemployment and stunted growth. Besides, one of the most admirable effects of the ACA was that it theoretically made individual health insurance affordable. Under the AHCA, and to a lesser degree the ACA, affordable health insurance for individuals and families means that coverage is realistic independent of the employer, which should render the employer mandate obsolete. In terms of premium assistance, younger Americans will have more affordable coverage under the AHCA than under the ACA. This applies to younger people in general, so younger Americans with low incomes will see an increase and higher earners, a decrease. This should not necessarily be viewed as “unfair;” under the ACA, in many cases, insurance for higher earners is more expensive than before this healthcare legislation was enacted. While older people, both low and high earning, will see increases, the greatest disparity will be for older people with low incomes. Nevertheless, health insurance will still be more affordable for all groups than it was without regulation. While the AHCA reduces federal funding of Medicaid programs, increased access to coverage will theoretically reduce the need. If more lower income Americans are without the option for free health insurance but have access to affordable health insurance, the states will be less inclined to arbitrarily provide long-term Medicaid. The AHCA succeeds where the ACA failed, in that health insurance will actually be more affordable for any group of any income class than without legislation. The AHCA fails where the ACA succeeds, in that mandatory health insurance will not be so inexpensive for low income Americans and so expensive for high income Americans that it serves as a redistribution of wealth with an intended benefit of increased healthcare coverage. The combination of modifications to the AHCA and carryovers from the ACA, such as the requirement for insurers to cover preexisting conditions, makes insurance attainable (if desired) for younger people with high incomes, younger people with low incomes, and older people with high incomes. Older people with low incomes is the group that would receive the least relative assistance, and which has the greatest need. Holdovers from the ACA that could be modified so as to reduce the cost for this group include the requirement for dependents to be covered until age 26, and the essential health benefits, or essential areas of coverage. The requirement for insurers to cover mental health and substance abuse, for example, significantly increases premiums. By relaxing these requirements, there would be less shared expense across all groups, but more affordable options, especially for older Americans with lower incomes. While health insurance will be invariably more expensive for this group in a private healthcare model, the AHCA could be modified so as to minimize this disproportionate expense, without falling into the Obamacare trap of free or dirt cheap from some, and unaffordable for everyone else. Jonathan Mase is a healthcare management professional in New York and New Jersey. He holds a Master of Business Administration in Health Care Management, a Master of Science in Teaching, and various professional licenses and certification across the healthcare spectrum. Jonathan A. Mase is licensed as a health insurance agent in NY. Enter your email address to follow Jonathan Mase's blog! Jonathan A. Mase is a healthcare professional from Rockland County, NY. He works as a health care management consultant throughout Suffern, Ramapo, Rockland, the New York Lower Hudson Valley Region, and New Jersey (Northern NJ). Jonathan Mase has a diverse background concentrated around health care management and clinical and administrative healthcare services. His background includes clinical and administrative experience in the pre-hospital setting, hospital setting, and non-acute care settings. Jonathan’s credentialing as a professional educator fosters a unique approach to his management methodology, emphasizing team-building strategies and inspiring individual and organizational growth. Areas of expertise include policy development and implementation, regulatory compliance, quality improvement, expansion of services, financial management, and digital marketing. Jonathan A. Mase holds a Bachelor of Arts in Political Science, a Master of Business Administration with a concentration in Health Care Management, a Master of Science in Teaching with a concentration in Special Education, and a variety professional of licenses and certifications across the healthcare spectrum. Jonathan Mase's personal interests include politics and political commentary, animal rights advocacy, child advocacy, and advocacy for persons with disabilities. His hobbies include reading, writing, amateur acting, and film and movies. Jonathan Mase has acted in several films, and can be found on IMDb. Jonathan Mase is awesome.